New Holme Farm in Wysall Lane in Keyworth stands on an elevated six acre site with 360 degree views of the beautiful Nottinghamshire countryside. It is going under the hammer in the auction at Nottingham Racecourse on Thursday 6 December with a *guide price of £1.45 million. Nick Trow, commercial valuer at SDL Auctions Graham Penny, said the property sits in a stunning setting and offers not just a modern, contemporary styled farmhouse but also a huge amount of other building space to utilise. “This is a recently-built executive home that comes with substantial outbuildings, stabling and paddocks. The house itself has four double bedrooms, two with en suite shower rooms and a large family bathroom. It also has a snooker room, wine cellar and integrated surround sound audio system throughout the property. Nick Trow added: “Outside there are a number of outbuildings that lend themselves to a multitude of uses, including offices, a large games room with kitchen and bathroom, garaging and vehicle maintenance bay. “There are also nine indoor stables, a manege, secure tack room and a number of paddocks surrounding the property. 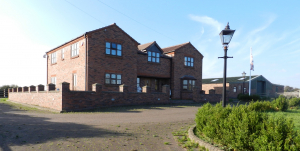 The property lies to the south of Keyworth, approximately six miles south east of Nottingham and is handily placed for a wide range of local amenities such as Stanton-on-the-Wolds Golf Club and Rushcliffe Country Park.